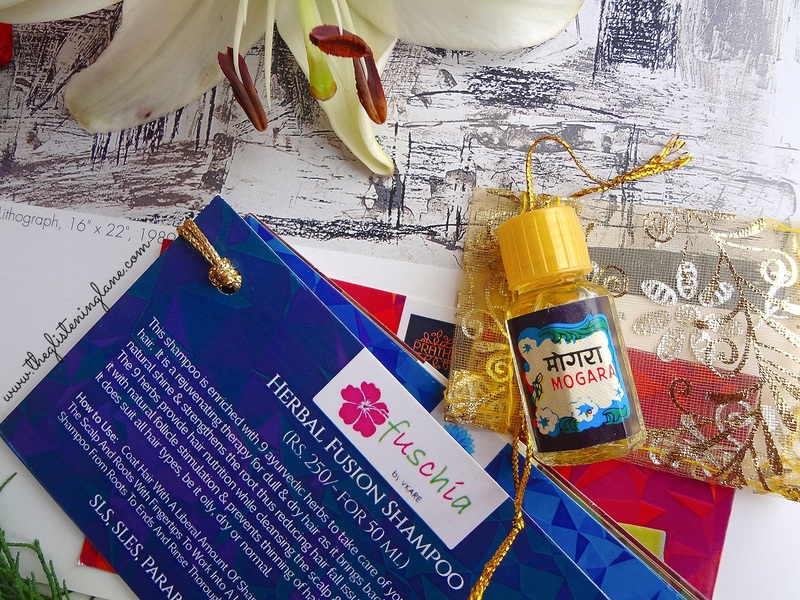 Lately, the number of subscription boxes available within the Indian market has increased. Every other person seems to be curating & launching their set of subscription bags/plans. At the same time, a lot of the amateurs have taken it onto themselves to dispatch certain products that are from no brand, or they begin with in-house production and claim about founding out a completely new brand! Yes, such things happen. Even fake lipstick; mind that! And when the blogger community puts them to light, every sort of lame excuses are catered. 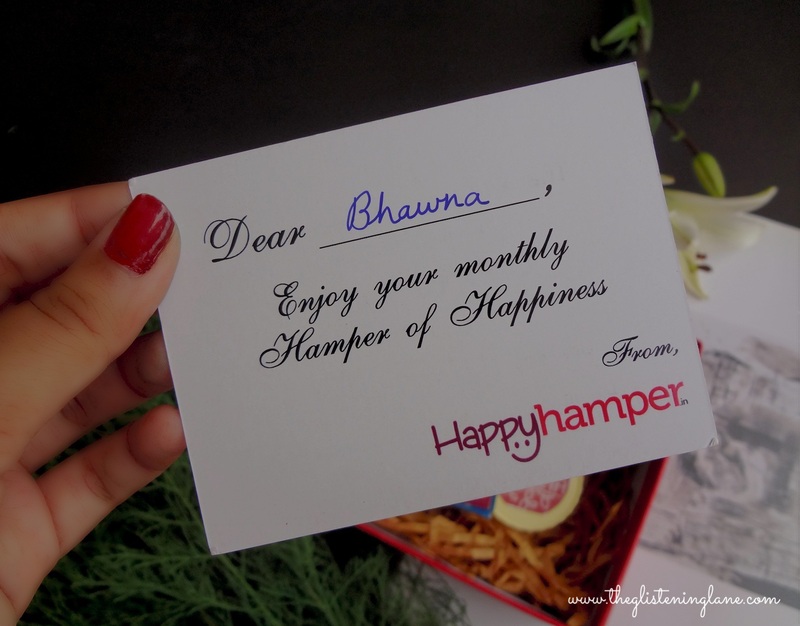 But thankfully, I saved my bucks & invested upon Happy Hamper only after seeing good reviews of it. Also, their team is kind enough to acknowledge and accept any constructive criticism/suggestions. Happy Hamper did provide a makeup product last month, if I’m not wrong; but I felt that, this month a lot of the known brands have been bought on board. 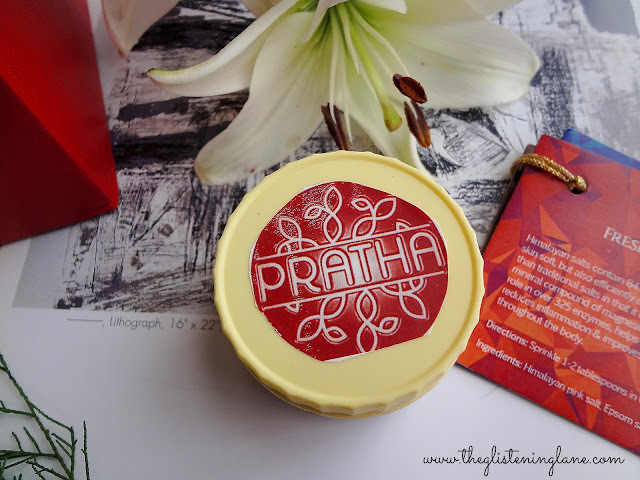 And since you guys know my love for trying out new products & brands, and so many options to choose from among several subscription boxes helps in suffusing that intent. So much so that I’ve never invested upon more than one month subscription for any Subscription Box! 😅 Anyways, let’s begin with what I got in my August Happy Hamper Box! Theme of the Month: The theme of this month is ‘Take Care’ which is perhaps why every product is from skin or hair care range. The courier arrived to me within several layers of packaging for extra safety. Once the plastic courier layer was dissected, I could detect an ordinary brown box which thankfully wasn’t our Happy Hamper Box! Inside it was the much awaited box, safeguarded in bubble wrap. Now, who would want their products ruined within the transit? Definitely NONE! To find multiple layers of packaging, I was struck at how much thought has been devoted by Happy Hamper team before the parcel is shipped. And this is not it; the box consisted of paper shavings & each product also had its plastic film tightly wrapped around. The actual Happy Hamper box has red and cream colour scheme going around and I’m definitely gonna re-use it as an accessory storage box. ▶A 10% Discount Coupon Code which is to be used for the next purchase. 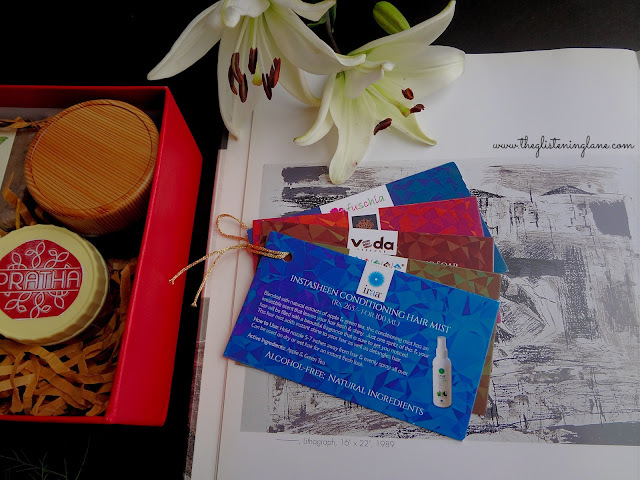 ▶Stack of cards which introduce each product that has been included within the Happy Hamper Box. ▶All products with a Bonus Free Gift! Delivered In: I ordered mine on 6th August, 2017 which was a Sunday & received it on 10th August, 2017 (Thursday). In total, the courier was here within 4 days (or 3 working days). Within subscription boxes, I detest it when they take almost half of the month for the product to be delivered onto my door. Infact, in some cases of Subscription boxes, I’ve heard so many people being annoyed as it took 20 days for them to drop the courier at their doorstep! 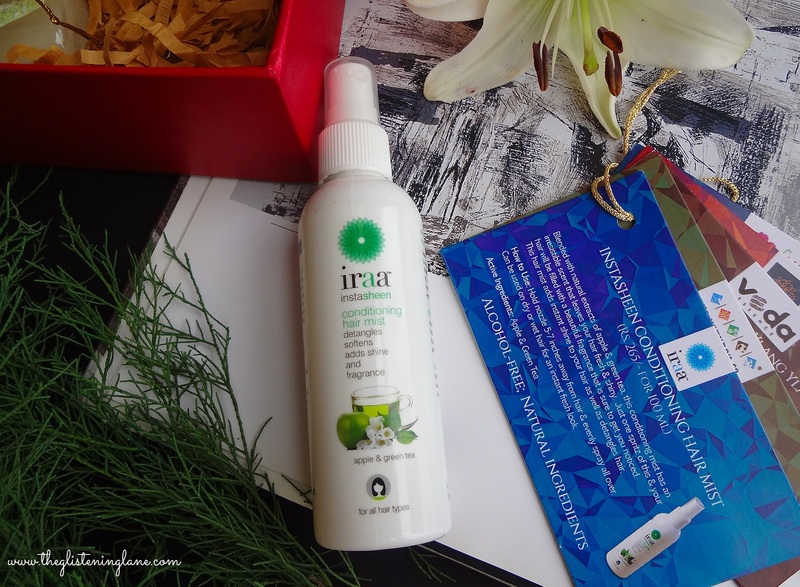 Iraa Insta-Sheen Conditioning Hair Mist (Rs. 265 for 100 ml) – Since I have thin and straight hair, my major concern was if it would weigh down my hair and decrease its volume, but thankfully it didn’t! The amount of hydration endowed with this is pretty lightweight and not in abundance. But of course, it leaves your hair smelling quite amazing. The Nature’s Co. Corn Exfoliating Face Pack (Rs. 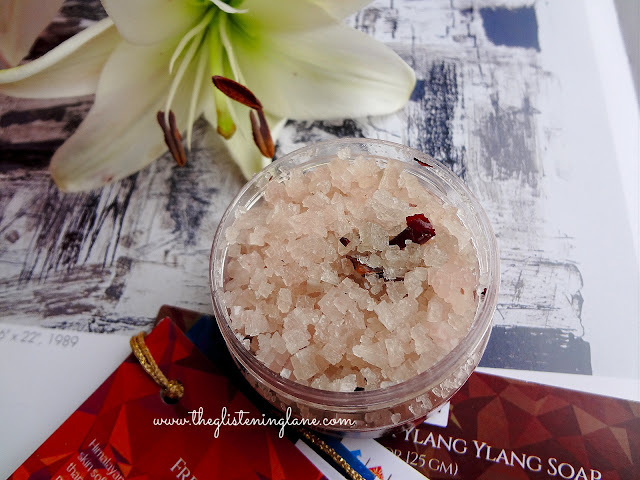 695 for 50 ml) – To me initially it looked like a hydrating scrub but after my first attempt with this, I simply love it! It makes the skin radiant and with no excess sebum. 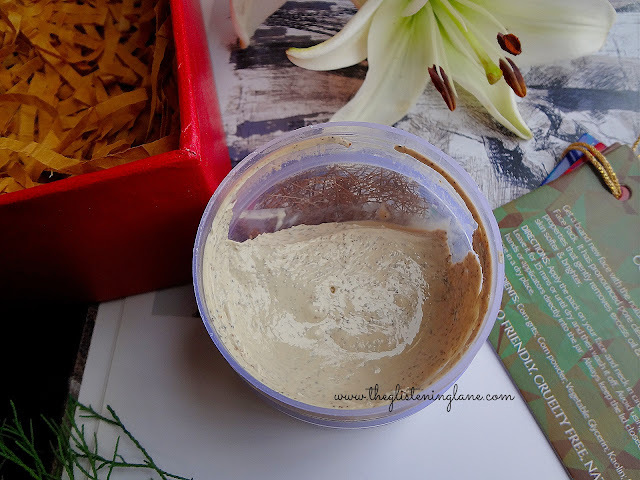 I don’t know about others but for my oily skin, this product is bae! Yet, can’t deny the fact that quantity provided by the brand is definitely less for the price point. 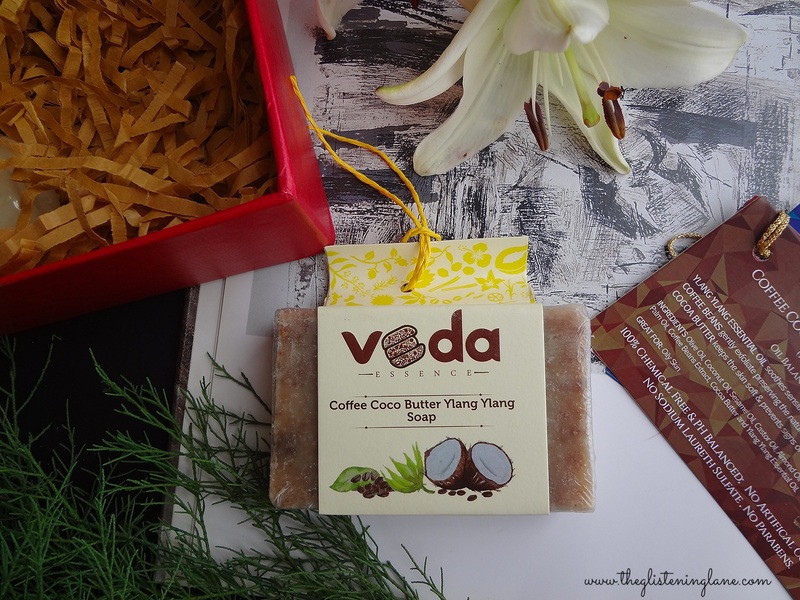 Coffee Coco Butter Ylang Ylang Soap (Rs. 210 for 125) – I haven’t really tried it yet but once I received some soap in my GloBox and it was really harsh, as in it had harsh scrubbing molecules. Let’s hope this one has nothing of that sorts! But since it has coffee, I’m looking forward to its fragrance within shower. Pratha Fresh Rose Refreshing Bath Salt (Rs. 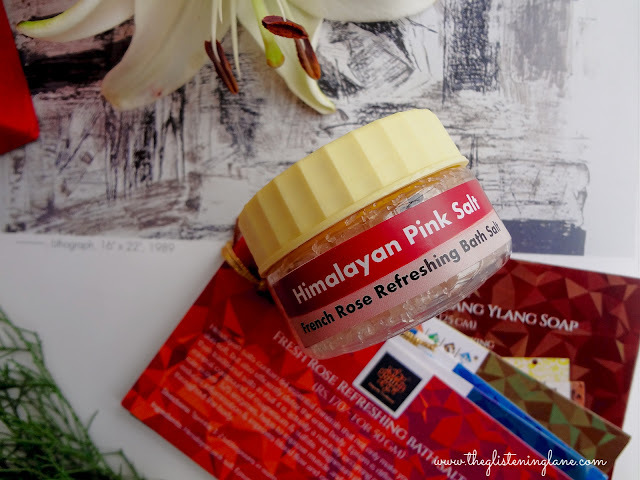 170 for 50 grams) – Some time back, I was at some event & Fuschia had its bathing salt kept on display which tempted me to try them out. But let me be honest, I’ve never tried a bathing salt and the brand name too isn’t acquainted with me. Fragrance of this one also is really amazing. 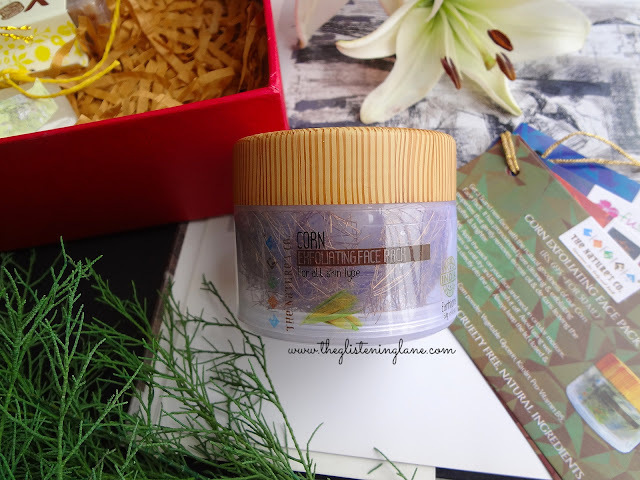 Herbal Fusion Shampoo (Rs. 250 for 50 ml) - Since it claims to hydrate, I’m kinda sceptical with this one for my hair type. 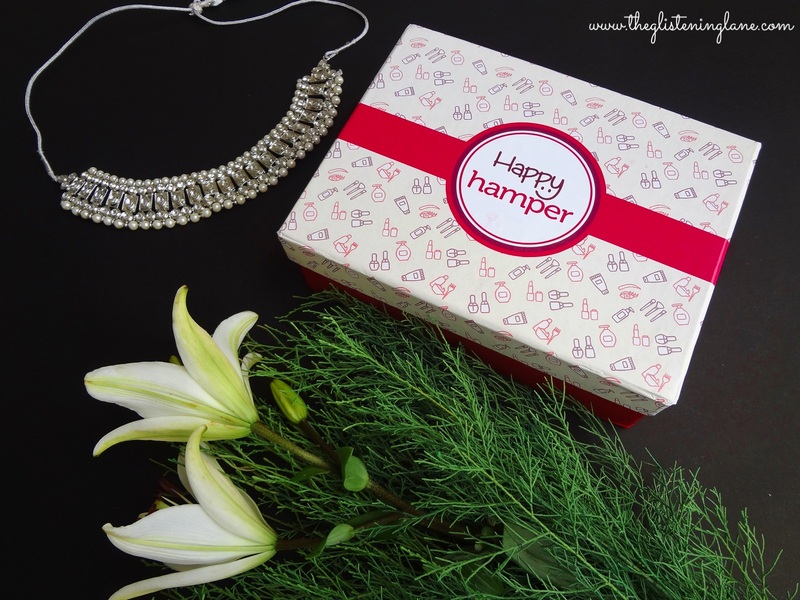 When my Happy Hamper reached me, I was pretty keen to un-box it; not that I wasn’t aware about the products inside. Infact, instead of preferring a surprise, I opt for knowing the products well in advance, only then do I book my order. Well, that’s my way of judging if I really need that month’s box or I can instead invest upon a makeup items I’ve been crushing over. 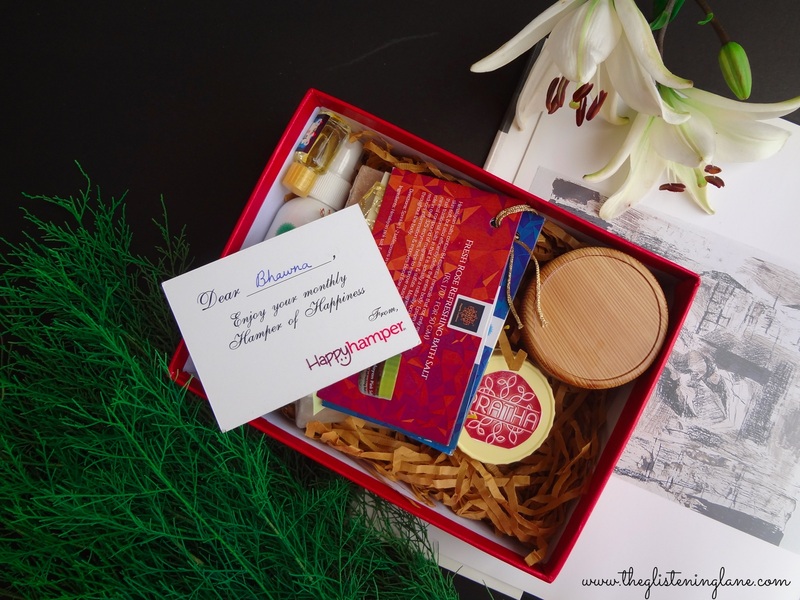 Inside Happy Hamper, the first thing detected was a Coupon Code for next purchase, providing me 10% off. It also said my name which was handwritten. Apart from this, there’s a stack of colourful informative cards which introduce you to the products. I really appreciate the fact that the amount/MRP stated over these placards is based upon the net worth of product that has been sent to us. Unlike some other subscription boxes, say Fab Bag which provides you the price of full sized product but a lot of the times they send merely samples & then you have to sit and compute the value of bag monthly. Also, all the products within Happy Hamper are full sized products instead of samples; except for the Ittar, value of which isn’t computed within the box’s worth this month. 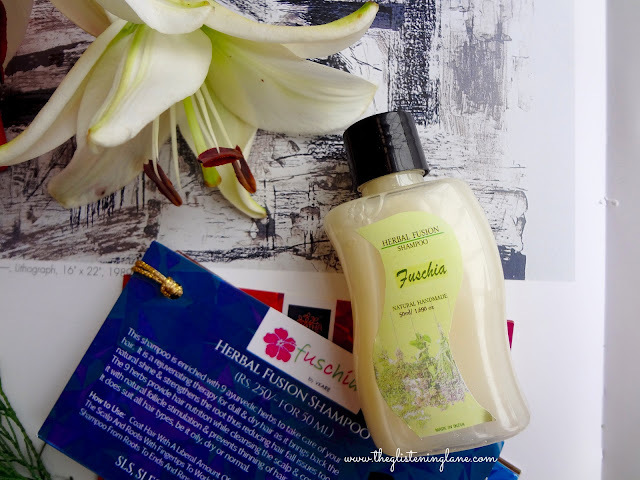 Initially I assumed that Fuschia’s Herbal Fusion Shampoo is a sample but it isn’t. On inquiring, I got to know that the product size is by default set to this by the Brand (Fuschia). For the price point, I do feel it’s quite tiny & would last three to four washes. Also, since I mentioned about Ittar, it’s actually a bonus product incorporated within each box. 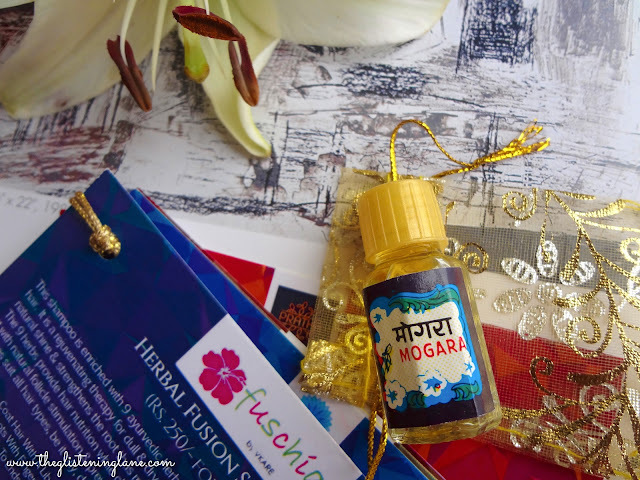 Now, people who received the Hamper before Rakshabandhan got a freebie rakhi whereas post the festival, people were sent this Mogra Ittar! Lastly, I’m pretty much happy with what all I received but just one more thing; I wish The Nature’s Co. product provides a little more quantity of the product for the price point. The packaging is fancy but the content is what I shall be using. 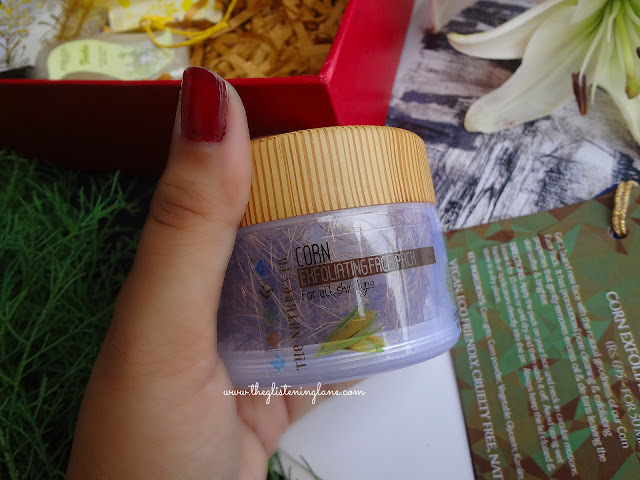 The products have been customized; I mean I have an oily skin type so the Corn Exfoliating Face Pack was added but I can’t say everything is completely based onto the information that was filled in. I think for my hair type I wrote – Thin & Straight Hair so I ditch Conditioning Mists but as long as it does not weigh down my hair, I’m all pumped up to try it! I hate it when some subscription boxes deliver late. Once I even unsubscribed and got refund. Good to know that this subscription delivers faster. Awaiting the review of TNC face pack.